NEW ORLEANS, March 21, 2018 — Tiny floating robots could be useful in all kinds of ways, for example, to probe the human gut for disease or to search the environment for pollutants. In a step toward such devices, researchers describe a new marriage of materials, combining ultrathin 2-D electronics with miniature particles to create microscopic machines. "You can make electronic circuits that are a single atom thick, which is just insanely thin," Michael Strano, Ph.D., says. "One creative use no one has thought of until now is taking these electronics and grafting them onto a colloidal particle. The particle, which can float in the air like a speck of dust, has simple computing functions. You can bring these new electronics to environments they otherwise could not access." As a first step, the researchers needed to develop a compatible set of electronic components for the particle's coating to form a closed autonomous circuit. "This was difficult to do," says Volodymyr Koman, Ph.D., a research fellow in Strano's group at Massachusetts Institute of Technology. "We went through a number of different devices to meet certain power and energy requirements." In the end, Strano's team selected a biocompatible material, SU-8, for the micrometer-sized particles and lithographically etched them to create a closed circuit consisting of a power source, a detector and a memory device. The power source was a p-n heterojunction of MoS2 and WSe2 that can convert light into electric current. Both MoS2 and WSe2 are 2-D semiconductors. The detector was a chemiresistor, a distinct single layer of MoS2, designed to change its electrical resistance in response to an environmental agent. The electrical output is stored in a memory device consisting of a separate layer of MoS2 flakes sandwiched between gold and silver electrodes. The researchers envision a range of uses for these miniature flying machines. Monitoring large areas for bacteria, spores, smoke, dust or toxic fumes currently requires enormous resources, Koman says. Satellites or a fleet of flying drones can do these tasks but they are expensive, while on-the-ground sensors require labor-intensive installation, which is often slow in comparison to the aerosol spreading velocity. "As an alternative, we introduce the concept of an aerosolizable electronic device," he says. As one example, the researchers tested the tiny devices in a simulated gas pipeline. The flying machines successfully sailed through the test chamber and detected the presence of carbon particulates or volatile organic compounds along the way and stored this information in memory. "We put small retroreflectors on the particles — like you have on your bicycles — so they reflect light and allow us to rapidly find the particles," Koman says. After capture, the researchers downloaded the information from the particles. "For readout, the particles have designated metallic connections, like a socket: Once you insert two probes, you can read out the device's state." The memory can then be wiped so the miniature machines can be reused. The researchers' next steps are to develop particles for additional applications, including as monitors of the human digestive system. "This is the right idea and the right time," says Strano. "Think of these as proto-robots." Strano and Koman acknowledge funding from the U.S. Office of Naval Research Multi University Research Initiative. Koman is supported by the Swiss National Science Foundation. 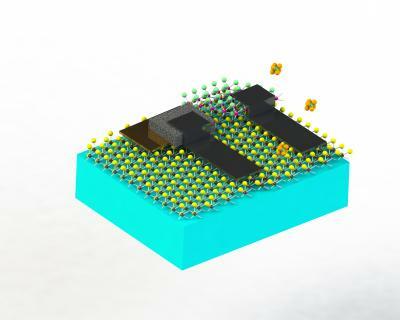 A here-to-fore unexplored property of 2D electronic materials such as graphene, hexagonal boron nitride and MoS2 is the ability to graft electronic circuits, transistors, memory and sensors onto colloidal particles. Such particles can access local hydrodynamics in fluids to impart motility and can otherwise access spaces inaccessible to conventional electronics. Herein, we develop a 2D material transfer approach combined with conventional lithography to pattern completed, functional circuits on SU-8 particles (100x100x1 μm3) that function as fully autonomous state machines. The circuits are powered by a p-n heterojunction of MoS2 and WSe2 operating as a photodiode, which powers, as a chemiresistor circuit element, a distinct MoS2monolayer for the detection of VOCs or carbon particulates. Finally, the electrical output is irreversibly stored in a memristor device placed in series consisting as a distinct MoS2 flake sandwiched between Au and Ag electrodes and protected from the environment by hBN monolayer. These colloidal state machines are capable of operation after aerosolization and hydrodynamic propulsion to a target over 0.6 m away. The devices can successfully detect the presence of select analytes while aerosolized, storing this information in memory on the particle for retrieval upon capture. An incorporated retroreflector design of the system allows for facile position location using optical detection. Such state machines, enabled by 2D nanoelectronics, may find widespread application as probes in the human digestive tract, oil and gas conduits, chemical and biosynthetic reactors, and as autonomous environmental sensors.